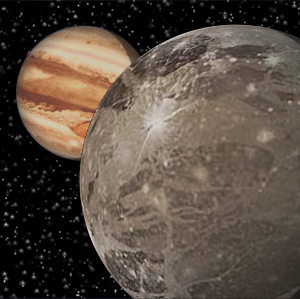 The largest natural satellite in the Solar System is Jupiter's Galiliean moon Ganymede. This moon is marginally larger than Saturn's own giant satellite Titan, with a diameter more than one-and-a-half times greater than that of Earth's Moon. A term coming originally from the Latin for 'attendant', first used by Kepler to describe bodies that orbit another more massive body. In principle the term can be applied to any body in such a gravitational relationship (so, for example, the planets of the Solar System are satellites of the Sun). In practice, at least for natural bodies, the word satellite tends to be most commonly used of moons or moon-like objects, such as the attendant satellites of asteroids or dwarf planets. The same word is also often used of spacecraft placed in orbit around a planet - especially the Earth - which are more fully referred to as artificial satellites to distinguish them from natural satellites such as moons.